Francis Redwood left New Zealand at the age of 14, and went to France to be educated. He returned as the second Bishop of Wellington, and one of his major interests for the rest of his long life was the development of Catholic education. One of his earliest and most significant achievements was the opening, in 1885, of the first Catholic secondary school for boys in New Zealand, dedicated to St Patrick. This was, at least in part, due to the fact that the first Rector, Dr Watters, and the founding staff were recruited from the Marist seminary of St Mary, Dundalk, in Ireland where the Bishop himself had once taught. Before it could be established, however, there was an extensive and arduous fund-raising campaign through most of New Zealand, highlighted by some remarkable stories of generosity and sacrifice. The College, to begin with, placed a good deal of emphasis on the boarding side of the establishment. It was a College for most, if not all, of New Zealand. Indeed, it even attracted early boarders from Australia. Certainly, students from as far away as Otago, West Coast, Taranaki, Hawkes Bay and Canterbury were numerous in the early lists of pupils. When the College opened there were more boarders than day boys, and the balance remained in their favour for many years. In fact, for its first forty years, the College had the field virtually to itself. In its early years, the College also had a central role in the Catholic life of the city. Such events as prize-giving and St Patrick’s night concerts were heavily attended, as were sports events. With no Catholic Clubs to support those who looked for sporting teams to follow, found them in the College, especially the First Fifteen. One of the earliest sporting expeditions saw the team travel, by sea, in 1889, to play Otago Boys – and win. The first game against Wellington College took place in the College’s first year. Further ventures into the realms of art and culture included regular Sunday afternoon concerts at the College by the band, under the direction of Mr Salvatore Cimino. The College’s first twenty-five years were properly celebrated in December, 1910, with a concert, a picnic, and an extremely solemn High Mass. It was, as were so many, a Wellington Catholic occasion. It was not long after followed by the first real setbacks the College had; the first World War was followed by the influenza epidemic in 1918. Though the war had no direct effect on the College itself, it bore on many families connected with the College and on old boys of preceding years. It has been estimated that a quarter of all Old Boys served in the war – which meant almost exclusively in the army. Not only were there casualties, but everyone knew someone serving. killed or wounded. Old Boys organisations, in particular, took a long time to recover. Many senior pupils left early – many to take over farming activities their brothers had left, some, even, to enlist themselves. Almost to underline the effects of the war came the influenza epidemic of 1918. This had serious consequences all over the world, and New Zealand was not spared. The problem of the 100 or so boarders was solved by closing the school early for the Christmas holidays. The College’s dormitories were given over to emergency hospital use, and almost 100 patients were cared for by the Sisters of Compassion. Of these patients a third died. Many of these events took place during the rectorship of Father Gilbert, the first Old Boy to fill that place. He appears to have been the first to moot any significant change in the College’s functions by investigating the possibilities of a new site. As the growth of the city put pressure on the College’s resources one of the problems was space. In accord with the concept of a new Cathedral somewhere in the vicinity, properties round about were being purchased, but it would be many years before they became available to the College. Instead, a site in Miramar was investigated, land purchased,and even sketches of buildings were prepared. In the end, its unsuitability was recognised and a site in Upper Hutt chosen instead. By the end of Fr Gilbert’s stay as Rector, Silverstream was more than just a vague idea. No doubt life went on as usual, but the development of a completely new College, which would change the old one for ever, must have been in many peoples’ minds. The manner of the division, reflected in the attitudes of those who stayed and those who went, both staff and students, re-echoed for many years. Stories of what went and what was left – names, colours, relics, even what might have been called the soul of the College, were retailed for many years. Even the Rector left, to become the first of the line at Silverstream. His successor faced a role of 180, a clear sign of the nature of the problem which led to the establishment of Silverstream. Even though the Depression must have affected the ability of many families to maintain children at secondary school, the role was to continue to grow slowly over the war and post war years. In other ways, the loss of a large slice of the senior boys when Silverstream opened, inevitably weakened sporting teams and deprived the College of the continuity of community which the boarding part of the College had imparted. Once again, the intervention of war produced marked effects. The many old boys involved - and news of their doings and of their fates was regularly made known - was a repeat of 1914-18, but the proportions had changed. They were a much smaller fraction of the whole body of Old Boys than had been the case 25 years earlier. Casualties were in fact almost the same. 60 years of the College were celebrated in 1945, but this was as much a post-war reunion of those who had been involved in the war as a jubilee. It also heralded the beginning of a period of expansion. The roll reached 250 in that jubilee year and went on growing steadily as the city grew to accommodate years of pent-up housing demand. The post-war baby boom took a while to reach the College, but new buildings were needed and the 75th Jubilee in 1960 saw a new science block as a reminder. As well, the closure of the old St Joseph's school in Buckle Street and the demolition of St Joseph’s Church added classroom space – albeit ill-designed for adolescent boys – and some more open space. Further, staffing issues were a result of the growth of the roll. For the first time in the history of the College, the balance between clergy and lay staff was virtually even. But a new problem was on the horizon. Barely had these additions and changes been absorbed than the whole future of the College, physically at least, was thrown into doubt. The heart of the matter was the proposed urban motorway, which was intended to carry vehicular traffic through, over or under the city, from Kaiwharrawharra to the Basin Reserve and beyond. When a City Councillor complained, in his role as Old Boy of the College, that the new motorway would go through his old school, he was told by the American engineer that it would go through the American Embassy. It is a rare irony that the embassy disappeared very early in the piece, whereas, though the College has been moved, no motorway touches its site. There were two problems to be solved, and they would take some time. Not only had a new, and suitable site to be found, but also there had to be a solution to the matter of compensation. It was of great help to the College authorities that the Marist Brothers School in Thorndon was in the path of the motorway much earlier, and the solutions to that “confiscation” could be invoked as precedent. A new site was a different matter. Money could be found, but bare, or near-bare land was much harder to find. At one point, it looked as though the College might have been moved to a site behind Government House. Neighbourly relations with Wellington College would have been interesting. Eventually, a site was cobbled together by Government and Council, utilising an area of land previously used as an athletics track at Evans Bay. There were problems. Construction on what was largely reclamation required great solidity and the College authorities insisted on permanent matrerials. They did not want to do it again, and remembered the solidity of the old College, which resisted demolition with great stubborness. The closeness to the airport meant noise abatement was a priority, and northerly winds could do nasty things when combined with the waters of Evans Bay. But in 1979, Father John Weir followed in the footsteps of Fr Dowling and became the second Rector to start anew. At least he had all the boys he began with as he led them en masse from Cambridge Terrace to Evans Bay Parade to take possession of the new College. 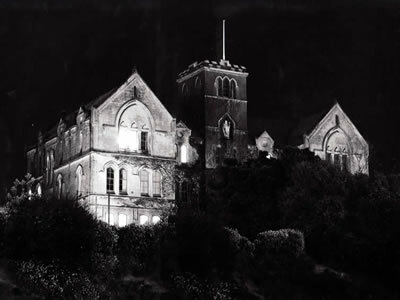 In a very few more years – six to be precise – the College embarked on the celebrations of its century. The presence of an Old Boy Bishop, Cardinal Tom Williams, gave an extra warmth to a memorable occasion. To put it into perspective, the College had beeen in existence for 100, out of the 145 years since the city was founded and is one of its oldest institutions. By now, the trend for an increase in the proportion of lay staff had become stronger and lay teachers outnumbered clergy for the first time. It began its second century in a new place and with buildings which must have seemed elysian compared with the old and outmoded castle left behind in Cambridge Terrace. Yet there were many regrets, and plenty to say that the old spirit of the original took a while fully to revive. The declining role of the Society of Mary was related to the decline in vocations, as well as to the steady rise in the school’s role. However, the time was near when the Society was nearing a decision to withdraw in stages from any large-scale role in the schools it had founded. It retained, by and large, its proprietory roles through the College’s Trust Board. Father Fred Bliss was the last of the Society’s Rectors and his replacement by Graeme Dee in 1991 was a huge change in the long life of the College. He was followed, in 1996, by Ann Dickinson, in surely an even greater change. The present rector, Gerald Tully, restores the task to a St Pat’s Old Boy, albeit Silverstream. For those who attended the College in the more distant past, in particular at Cambridge Terrace, such changes must seem huge. Physically, of course, little is the same. The make-up of the school population has also changed. The gradual departure of almost all full-time religious staff has also seen an increase in the number of women staff members, though males still predominate. The pupil mix has also changed ethnically. More than a quarter of the roll is Polynesian, with more than 20% Pacific Island Polynesian, about a third is European, and the rest Asian, inluding a small number of overseas students and even a handful of Iraqi refugees. The Society maintains a presence nearby, and various members have roles and tasks associated with the College – chaplaincies, etc. Most recently The Trust Board has made a substantial contribution to the redevelopment of the Marist-St Pats Gym, which will include facilities for sports education for the College.